The American Idols LIVE! Tour 2009 was a summer concert tour in the United States and Canada that featured the top 10 contestants of the eighth season of American Idol. The 52-date tour spanning 50 cities began on July 5, 2009 in Portland, Oregon and ended on September 15, 2009 at the Verizon Wireless Arena in Manchester, New Hampshire. This year was without a sponsor as Kellogg's Pop-Tarts dropped its sponsorship. The show essentially followed the format of season seven tour where the performances were presented as a series of mini-concerts, starting from the 10th-place finisher and ending with the winner. As with season seven, each half of the show ended with a group performance, the first half consisting of a medley by the first six performers, and the last half ending with all ten performers. "No Boundaries" was dropped from Kris Allen's set starting on July 10, 2009 in Sacramento, California due to "poor audience response." The song was replaced with "All These Things That I've Done" by The Killers. 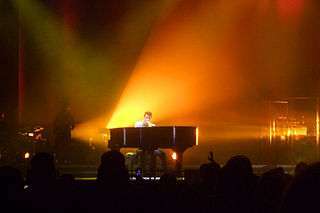 Kris Allen did not perform on the Bridgeport, Connecticut show on September 10, 2009 due to an illness but he did return for the rest of the tour after his recovery. Megan Joy did not perform the last group song in Los Angeles, California on July 16, 2009 due to food poisoning and being sent to the hospital shortly after her set but she did return for the rest of the tour after her recovery. The tour was nominated for a Teen Choice Award in the "Choice Music: Tour" category. The Season 8 tour equalled in its success to Season 7. Despite a slightly lower number of total tickets sold at 484,434, it averaged slightly higher in attendance percentage capacity and yielded a higher gross of $30,139,328 million. It was ranked number 28 in Pollstar's year end list of North American tours. Wikimedia Commons has media related to American Idols LIVE! Tour 2009.